Before viewing MEDITATION PARK, one should be made aware of the legacy behind Hong Kong actress Cheng Pei Pei who executively produced and stars as the lead in the film. Cheng Pei Pei was a star in her youth, who rose to fame from her first Shaw Brothers swords fighting action movie directed by King Hu, COME DRINK WITH ME. She was rumoured to be the mistress of one of the Shaw moguls. She continued her action roles in many other Shaw productions. Her last well known role was Jade Fox in Ang Lee’s CROUCHING TIGER HIDDEN DRAGON. She always sports the tomboyish short haircut, which she still does in MEDITATION PARK. 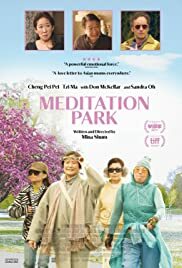 In MEDITATION PARK, Cheng Pei-Pei shines and shows star power as it is seldom seen. Cheng stars as Maria, a devoted wife and mother who is forced to reassess her reverence for her husband after she finds another woman’s thong in his laundry. She discovers that her supposedly devout husband, Bing (Tzi Ma) is not the perfect husband she thought him to be. They are visited by their daughter (Sandra Oh) who wishes her mother attend the brother’s wedding. The brother has been disowned by Bing. Maria starts tailing her husband to find out more of his affair. At the same time, Maria opens up her life and finds companionship through her assortment of friends as well as through a neighbour (Don McKellar). She finds that life has more to offer than just tending to her husband, and to one who has been unfaithful at that. Shun’s (DOUBLE HAPPINESS) covers many issues the main one being, oddly enough, a senior’s coming-of-age. Maria learns to stand for herself finally and do what is right. Shun also brings in her Chinese culture in the Canadian setting. Maria is shown as the typical Chinese elder, who stays home. Maria speaks limited English and cannot drive. When she tails her husband, she pays $240 in cab fare before learning how to ride a bicycle instead, a cheaper means of tailing her husband. There are some magnificent performances on display here, Cheng Pei Pei’s being the most obvious. Sandra Oh, who has been in Shun’s films in the past is always good and a pleasure to watch. Her confrontation scene with her father, also brilliantly played by Tzi Ma is the film’s highlight. Shun injects some sentimental moments through the character of a neighbour (McKellar) that Maria meets. Kleenex should be handy for the segment where he announces the death of his sick wife. Shun does not compromise her film for the typical Hollywood ending. The father does not end up attending his son’s wedding as would be expected. Maria and Bing do not reconcile in the usual way. This is what stands out in Shun’s film, which is a big improvement over her past two efforts. MEDITATION PARK should be seen for it being Shun’s best work and for Cheng Pei Pei’s controlled yet powerful performance.